Go to the Microsoft site to see the full spec of this product. Celebrates the first 100 years of powered flight with a collection of important historical aircraft and exciting new features that continue the traditions of realism, technological innovation and richness that have delighted aviation enthusiasts and pilots around the world. This 20th anniversary edition includes nine historical aircraft as well as 15 contemporary aircraft and represents the most comprehensive and compelling version in the history of the franchise. 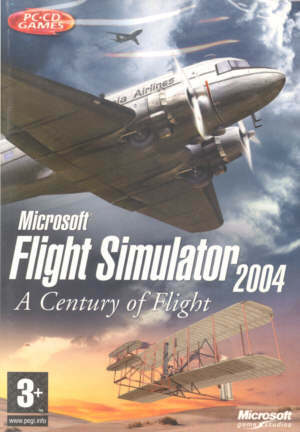 Microsoft Flight Simulator 2004 also introduces an updated, dynamic weather system, enhanced automatically generated scenery and detailed visual effects. 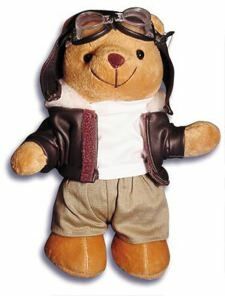 These finest quality 'Biggles' style bears dressed in waistcoat, scarf, helmet and goggles make ideal gifts for special occasions or achievements. Dressed in a waistcoat, scarf, helmet and goggles they realistically and humorously represent pilots from the 'open-cockpit' era. Standing 20cm (8") tall, his skin is a soft-fur and he conforms to British Safety Standards for toys. See our Flying Page for more ideas. Ask for estimate with your order as it depends on the weight, the country the order is to be sent to and whether insurance is required. A �5 handling charge will be added. We do not accept any card transactions over the telephone or have a secure connection on our web site. pick up the phone and tell us that information. issue a PayPal invoice via email to pay us via PayPal. Your Rakewell invoice will be sent with the goods you have ordered. We may make this facility available on our web site in the future. These instructions will be updated when this happens. NOTE: You do not have to have a PayPal account to use this service, they only act as a collecting agency. You use your credit or debit card as before. We have opened a PayPal account for payment, as the Bank were going to impose further costs to us to comply with a new standard (PCI DSS) for accepting credit cards. The advantage to you using PayPal is that we never have sight of your credit card number - this information is only shared between you and PayPal. Our Banking details for On-line Banking and BACS transfer (are the last item shown on the right-hand side). for non-urgent orders, cheques (made payable to Rakewell Limited) may be posted to us. Payment, Credit Cards and Overseas Orders. Note:- rakewell.com is neither recomending or endorsing these services. You may find using this service you get a better exchange rate. Goto their website for more information. You may use our PayPal service as described above. We accept payment by cash, cheques drawn on a UK Bank in � sterling (Please ensure that we do NOT occur any Bank charges or costs. ), BACS transfer and VISA & MASTERCARD credit cards. Banks normally assume that we share costs, we don't so if you want to use electronic Banking, make sure that you pay all the costs..
Use this real-time currency converter to calculate our prices to your local currency. There is also a hidden Bank charge credit card calculator at this site to work out what the charge was after you have bought the goods. Please note that normally the exchange rate is applied when we collect your money. Make sure that you either request that the rate is fixed or allow enough to cover any exchange rate fluctuations.